This wader is similar to a Common Sandpiper in size and structure. ﻿Adult birds have a dark head and upperparts, contrasting markedly with the white belly. The legs are a pale green, while the bill is a dark grey-green. In flight, the most obvious feature is the large white rump contrasting with the dark wings and tail. Juvenile Green Sandpipers are very similar to adults, though can be identified by having the upperparts finely spotted white. ﻿The flight call is loud "chu-wit-wit". The Green Sandpiper is a scarce passage migrant and a rare winter visitor to Tipperary. Birds can be found in almost any month other than May and June, but most records are from August and September. Birds are found usually singly at gravel puts, river banks and lakes. They almost always see you before you see them, and fly away with a "clu-eeet" call. Green Sandpiper, River Anner, Two-mile-bridge, Clonmel, 4.9.2015. KC. The Whooper Swan is similar in size to our resident Mute Swan. It differs from the Mute Swan in having yellow on the bill (Mute Swan's bill is orange) and having a straighter neck. It gets its name from its whooping, trumpeting call. 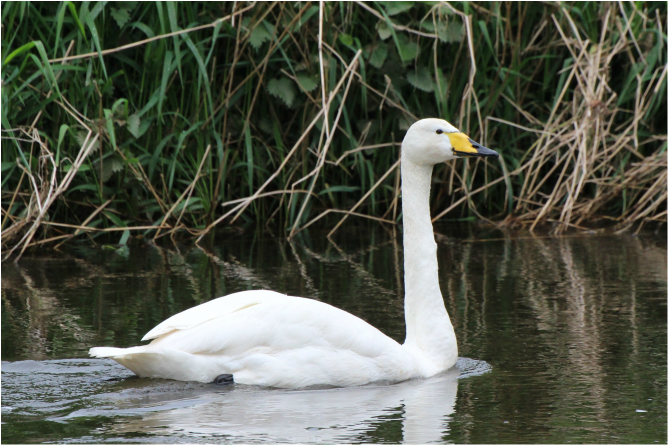 The Bewick's Swan is smaller than the Whooper Swan. It also has yellow in the bill but the yellow does not come down to a point like in the Whooper. The Whooper Swan is a winter visitor to Tipperary. They arrive in mid-October and head for traditional feeding and roosting sites. There are a number of sites clustered together in the north of the County. Flocks of over 100 are regularly seen at the Little Brosna callows, Lismacrory and Pat Reddan’s Lake near Borrisokane. The are also flocks at Lough Avan and Lough Duff and the area around Gurteen Agricultural College. The are flocks in the south of the County, mostly distributed along the River Suir. The is a large roost at Lyonstown Stud near Cashel. A flock is regularly seen just north of Thurles at Brittas and east of Thurles at Noard. Small numbers frequent Cabragh Wetlands. Another flock is found near Newcastle in the south, and these birds may move up river to Dranganbeg, Cahir, from time to time. Whooper Swan on River Suir near Golden. KC..
One Whooper Swan ringed at Arnavatnsheidi, Iceland on 14.8.1965 was recovered near Nenagh in November 1974. In a survey in January 2000, a total of 252 Whooper Swans was recorded in 8 flocks in Co. Tipperary. The mean brood size was 3.3 (N=23). When the survey was carried out in 2010, a total of 276 Whooper Swans was recorded in 8 flocks in Co. Tipperary. The mean brood size was 2.76 (N=17). One Whooper Swan spent the summer of 2011 at Lough Ourna.